Home  Blog  A New Weaver! I had the good fortune to spend time with Rob, the son of my greatest benefactor and friend (who is more like family) on Labor Day. He wanted to learn to weave, so I jumped all over that. 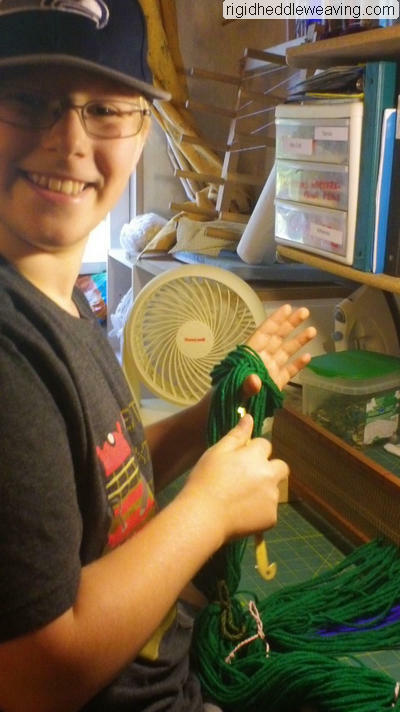 I started by explaining all the different parts of a loom, choosing yarn (he chose green and purple--I love this kid! ), then planning the project. 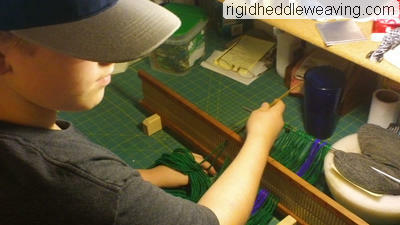 He made the warp on a warping board and sleyed the reed. Then we beamed it together. Next lesson will be showing him how to beam it by himself. This takes a lot of concentration and patience! Outdoor Weaving. It was a beautiful day and he's allergic to our cat so this worked out perfectly. 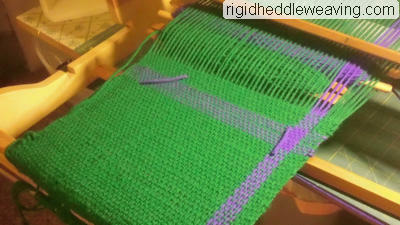 Could this be the birth of a master weaver? Only time will tell. The kid is a natural! The consensus is that HE LIKES IT! You can tell by his work. You can see how much is has improved already. We didn't get to finish it before mom had to come and get him. School started the next day so he's leaving it here for next weekend to continue working on it. He didn't want to get disatracted from doing homework with this staring him in the face. 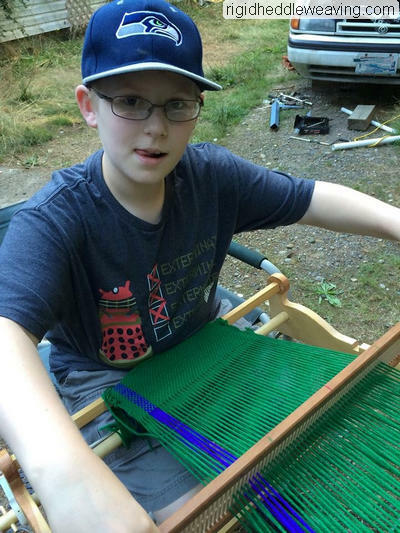 I wish I had known about weaving at his age. Combined with my love of sewing, who knows where I would be in the world of textiles, today. 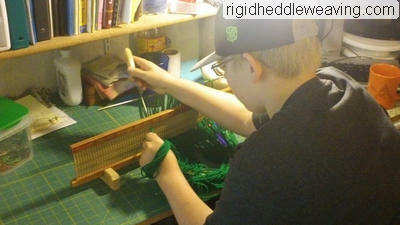 I want to teach him the inkle loom after this is finished and then, eventually, I'd like to get him weaving on a 4 shaft. We had a lot of fun and I can't wait to see him again next weekend!